TAMPA, Fla. -- Three College of Arts and Sciences faculty members at the University of South Florida in Tampa were named Fellows of the American Association for the Advancement of Science (AAAS) in 2013. Election as an AAAS Fellow is an honor bestowed upon AAAS members by their peers. In total, USF had six faculty members awarded this distinction in 2013. Associate Professor of Integrative Biology Gordon Fox, Distinguished University Professor of Global Health and Cell Biology, Microbiology and Molecular Biology Daniel Lim and Distinguished University Professor of Psychology Mark Goldman are the college’s newest AAAS Fellows. AAAS honored 338 members in 2013 because of their scientifically or socially distinguished efforts to advance science or its applications. With six Fellows in 2013, the University of South Florida ranked in the Top 10 worldwide for organizations with the most AAAS Fellows named in 2013. This is the second year in a row that USF has been in the Top 10 worldwide. USF is No. 1 in Florida for 2013 AAAS Fellows, also for the second year in a row. Others among the Top 10 include Vanderbilt University (18 Fellows); Duke University (12 Fellows); University of California, Davis (10 Fellows) and University of Michigan (8 Fellows). Pennsylvania State University and Texas A&M University tied for sixth place with seven Fellows each. Tied for seventh place with USF, with six fellows each, were Cornell University; Ohio State University; University of California, San Diego; University of Chicago; University of Nebraska-Lincoln and University of Southern California. 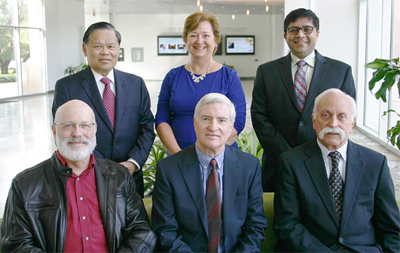 "The University of South Florida is proud of the research, scholarship and service accomplishments of these outstanding faculty members," said Dr. Paul R. Sanberg, AAAS Fellow and senior vice president for research and innovation at USF. "Our faculty are the key to our continued growth and success as a global research university." New Fellows will be presented with an official certificate and a gold and blue (representing science and engineering, respectively) rosette pin on Saturday, Feb. 15 at the AAAS Fellows Forum during the 2014 AAAS Annual Meeting in Chicago. The American Association for the Advancement of Science (AAAS) is the world's largest general scientific society, and publisher of the journal, Science, as well as Science Translational Medicine and Science Signaling. AAAS was founded in 1848, and includes 261 affiliated societies and academies of science, serving 10 million individuals. Science has the largest paid circulation of any peer-reviewed general science journal in the world, with an estimated total readership of 1 million. The non-profit AAAS is open to all and fulfills its mission to "advance science and serve society" through initiatives in science policy, international programs, science education and more.